If you’ve followed me over the years, you know I’m a double alum of the University of Maryland. Loved the place so much I stayed for 5 years. And for the better part of a decade, I’ve had a Maryland Terrapin mascot driver headcover. It’s a conversation starter, but it’s more been a symbol of pride. However, at this point in my life, I’m a dad more than anything. I have two great kids, and my life pretty much revolves around them and my wife, as well building Golf News Net. So, I was due for a headcover change, and that’s why Sunfish Sales reaching out was a case of perfect timing. Back in the day, I worked with Sunfish when what’s now the Unpro store was Pargoods, which was designed to be a dropshipping store promoting up-and-coming smaller golf brands. I loved what Sunfish was doing in the headcover space, and, even though Pargoods is no more (maybe it should come back), I’ve watched their growth from afar. And now they’re offering a new spin on headcovers, which they’re calling Photoflux. This is an emerging technology which gives Sunfish the ability to print photos and graphics directly onto a high-quality leather headcover or their leather yardage books or their leather putter covers. 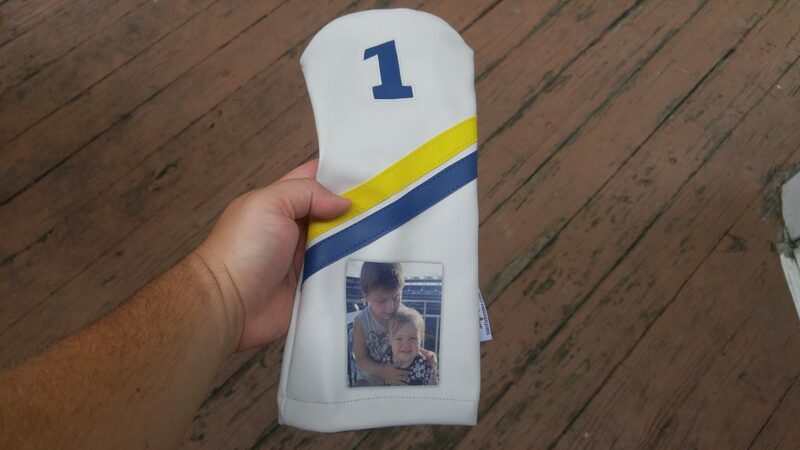 After checking out, you’ll get your headcover in up to 4 weeks. Every headcover is handmade from spec, and the guys at Sunfish make sure your order is done right. I got mine in much less time than 4 weeks, and the headcover is great. It’s lightweight, and it’s not bulky. The lining helps slip the cover on the driver easily, and the design tightens at the bottom of the driver head to make sure the cover stays on through the round. Now when I play golf, I’ll have a new conversation starter, and I can always look at one of my favorite photos of my kids together.